Last updated May 25, 2018. Scroll down to find a printable poster to distribute to families. An important part of a teacher’s role is to work with parents to provide the best possible outcomes for students. This involves strong two-way communication about a variety of issues. How do we keep our children safe online while ensuring their technology use is positive and purposeful? For the first time in history, many parents may feel like they don’t have a reference point to navigate digital parenting dilemmas. Their own childhoods probably involved minimal technology. Even friends and family with older children may not have faced the same scenarios currently playing out in family homes around the world. Technology has changed the way we live, work, play, learn, and interact. No doubt parents and teachers alike feel like they’re navigating uncharted territories. There can be a lot of guilt, anxiety, and confusion about the role technology is playing in children’s lives. While schools can’t be expected to have all the answers for parents, having an open dialogue about all aspects of digital citizenship is essential. Again, it’s about having the same messages and support reinforced at both home and school. Being in regular communication with parents, teachers are in a unique position to both listen and deliver advice or information to ensure everyone is on the same page. These key messages might form the basis for some of your conversations or communications with families. Scroll down for a printable poster. 1) DON’T BLOCK: Don’t let potential problems stop you from letting your child use technology for their education and personal interests. We live in a digital world and that is not about to change. Technology can enrich our lives in many ways, when used well. 2) COLLABORATE: Talk to your child about what they’re doing online. Take an interest in their interests and consider co-viewing or co-creating with them on some activities. Ensure you’re familiar with what your child is doing online, and their favourite apps or websites. 3) BE THE PARENT: At the end of the day, remember you’re in charge. Set boundaries and consider using filtering software and parent controls on devices (but be aware that this is only part of the solution). 4) COMMUNICATE: Work together with your child to navigate digital dilemmas and encourage your child to tell you if they ever have a problem online. Reassure them that you won’t take away their devices if issues occur. Many experts, such as Dr Joanne Orlando, advise against using technology as rewards and punishments. One reason is because you don’t want your child to be discouraged from talking to you about problems due to the fear of being disconnected. 5) FAMILY MEDIA AGREEMENT: Create your own internet/device rules for your household and have your child agree to adhere to them. This might include designated tech free zones such as cars, meals, and bedrooms. Many experts recommend these three areas as key places to avoid using devices. 6) PRIVACY: Teach your child to keep personal information private online. YAPPY is a useful acronym to remind children of some of the personal information they should not share on public online spaces (blogs, forums, social media etc.). YAPPY stands for: Your full name, Address, Phone number, Passwords, Your plans. 7) CRITICAL THINKING: Remind your child that not everything you read or see on the web is true, and not everyone online tells the truth. Internet users are increasingly being required to wade through the noise, distractions, and opinions that now flow freely online. Children need guidance to learn this skill. 8) AGE RESTRICTIONS: Avoid supporting your child to sign up for sites that are 13+ if they are under age (Facebook, YouTube, Instagram etc). When they are old enough to register, make sure your child sets their online accounts to private to limit access to people they know well. 9) BALANCE: Encourage your child to balance their screen time and green time, and encourage offline interests. Be wary of health problems from overusing technology (eyesight, posture, hearing etc.). 10) LEARN: Explore reliable resources for parents so you can educate yourself and protect your children. A few useful starting points include The Office of the eSafety Commissioner (iParent), Common Sense Media, and Child Family Community Australia Fact Sheet. A key message that underpins all of the above is: be a role model. Our own digital habits, like being constantly distracted by our own devices, are noticed by children. It can be easier said than done, but being more mindful of having a balanced approach to using technology ourselves is crucial. Monkey see, monkey do. This is is another question that’s important for schools and teachers to think about. There are so many conversations we need to have with parents about housekeeping issues, academic progress, behavioural or social issues and more. How do we also weave the topic of internet safety and digital citizenship into our conversations? 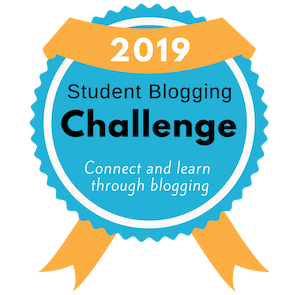 Class Blogs: I’m a big fan of having a class blog. A page could be used to list tips, or ideas could be published regularly as posts. Even better, have students create the posts. School Blogs: A school blog can also be a great way to share news. Check out the way Maple Cross School in the UK shares an ‘esafety newsletter’ on the sidebar of their school blog. They also have a dedicated page for internet safety. Newsletters: Put digital citizenship on the agenda in regular newsletters, whether your school/class uses a traditional paper newsletter or an email version. Events: Many schools offer internet safety information evenings for parents. These aren’t always highly attended. What about an event where children and parents learn about and discuss safe internet use together? Hopefully the lines of communication would then continue into the home environment. Common Sense Media offers some practical advice about holding parent events. Handout: I have created the following handout which you are free to print and distribute to parents, display at school, or publish on your school websites. 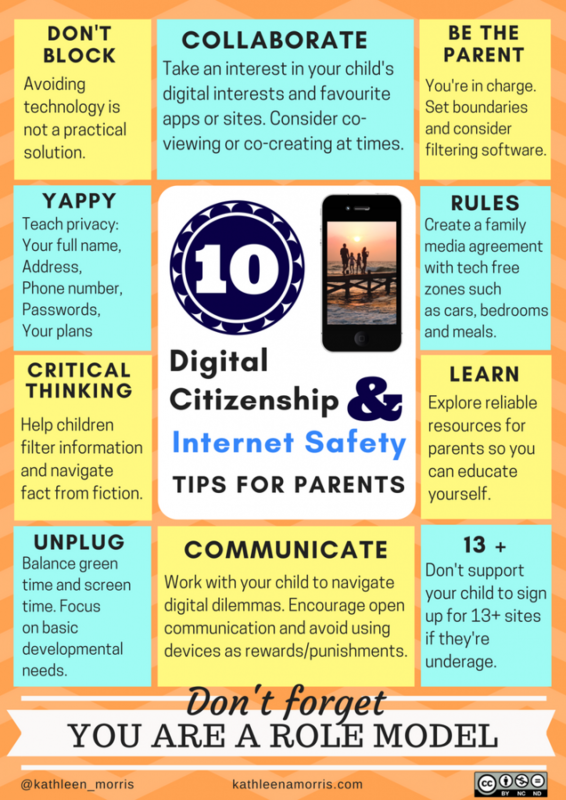 Tip: I also have a similar poster with digital citizenship tips for students which you’re free to print or use. The Bottom Line: What is Technology Replacing? The evolution of our technology rich world is improving our lives in many ways. Previously inconceivable tasks can be carried out with ease and people have more power than ever before to connect, learn, and grow. However, a key point to remember is that we don’t want technology to ever compromise children’s basic developmental needs. Things like sleep, relationships, exercise, nutrition, and play. These are non-negotiables and while life is changing in many ways, these core human needs are not changing. Above all else, there must be strategies put in place to ensure that children’s technology use isn’t encroaching on their development or taking time away from other healthy habits. Of course in some instances, technology can make a positive impact on these key areas of development. Often in ways that were not previously possible. For example, using Skype to connect with family members far away, or developing skills like creativity or language with appropriate apps or games. Perhaps it depends what the child is actually doing. Creating and purposefully connecting online is clearly more beneficial than long stretches of passive viewing. Additionally, using technology collaboratively at suitable times is clearly better than using inappropriate apps or sites alone late at night or when other tasks are a priority. So a shift in conversation to quality over quantity may be helpful. As long as basic needs are not being compromised and key safety messages are being followed, children can not only survive but thrive in our digital world. Let’s help them do just this. What other tips for parents would you add? How can schools pass on internet safety or technology use advice to parents? 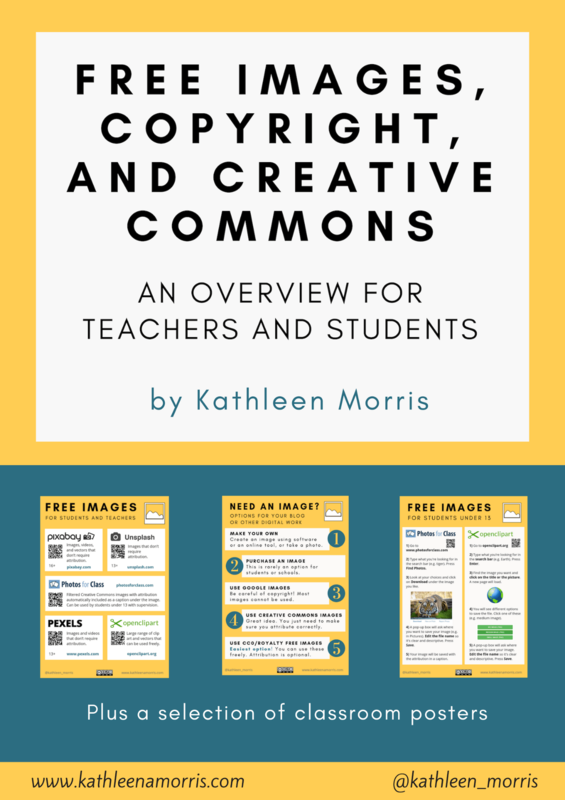 When you sign up, you’ll also get instant access to my free easy-to-read e-book with tips for teaching students how to research. It includes two classroom posters. 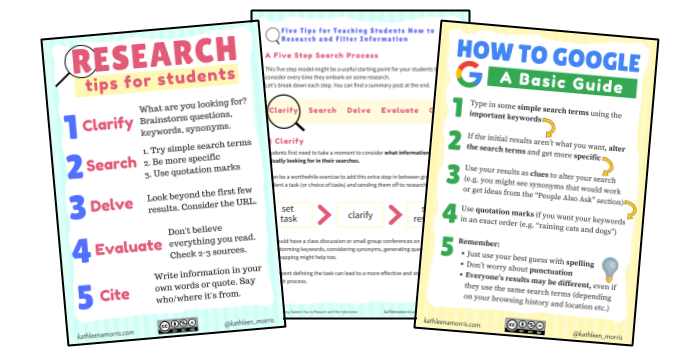 I created this after a number of teachers told me how useful they were finding my blog post on teaching students how to research.